Discussing situations involving sound or noise, everyone assumes that our ears are functioning basically like microphones, detecting physical parameters such as pitch and loudness. However, our auditory system is enormously more powerful and elaborate than that. A simplified version is presented in Fig. 1. The outer ear, not shown here, is supporting directionality of hearing, and suppressing undesirable noise under windy conditions. The middle ear contains the tympanic membrane and the famous three ossicles – malleus, incus, and stapes. It picks up airborne sound and sends it to the inner ear in a way that not too much energy is being lost. Cochlea and semicircular canals are part of the inner ear. The cochlea is an impressively complex device, converting vibrations into electrical signals that are being forwarded to the brain. Hair cells and traveling waves are involved. 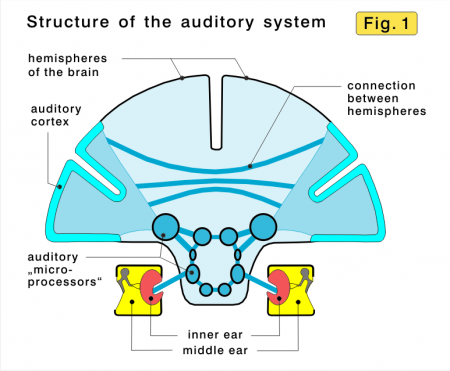 Because it is the primary purpose of our hearing system to extract information from incoming acoustic waves, a fascinating analysis of the signals arriving from the cochlea takes place. This task also demands detailed cooperation between both ears, in order to determine directionality and motion of sound sources. A number of interacting functional units – we can call them nowadays “microprocessors” – are working very fast, and subconsciously, to determine relevant patterns of the acoustic events to be heard. Results are sent to parts of the cerebral cortex, where the patterns determined are compared to the vast trove of memorized data, in order to determine the nature of the acoustic event just going on. Arriving at the acoustic cortex the person becomes aware what he or she is hearing, say a child is clapping with its hands, staying at the right side. 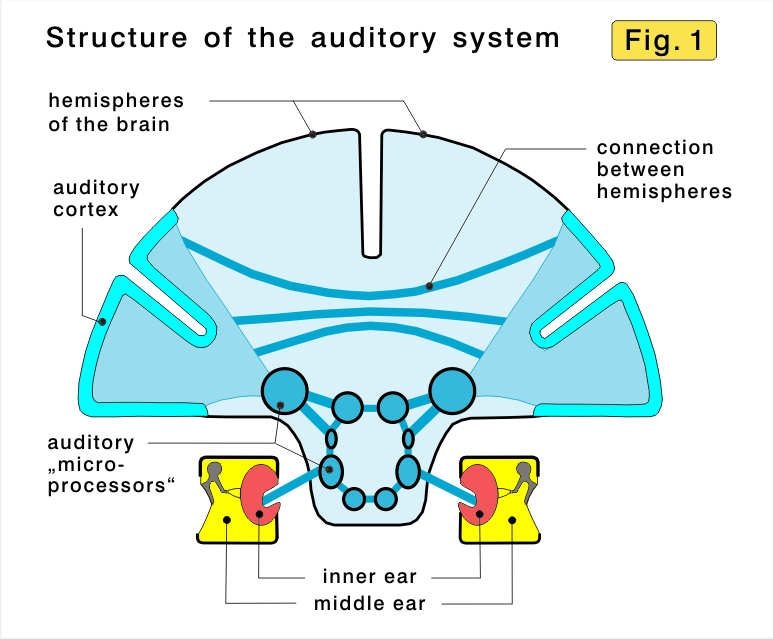 It is the duty of the auditory system to control the environment by systematically analyzing the incoming acoustic signals, and to make the person aware of the information obtained this way. Just walking through a city demonstrates the incredible capacity of this system. We hear women walking with high-heeled shoes, a boutique advertising its wares, a truck delivering a container, children laughing to the left, a helicopter flying overhead from left to right, a street musician starts fiddling behind, a buddy asking a question, etc., etc. And much of this multitude of tasks is being handled simultaneously. Including its analytical machinery, the ears never really sleep, because otherwise we would not wake up if the alarm is sounding in the morning. Modern devices are very quiet at first, demonstrating that loudness is not needed, only good pattern recognition by the brain. Noise is an important aspect, practically everywhere, and acoustic measurements are said to be essential, in order to tackle the problem. However, our sense of hearing is interested in the message, and not in acoustic parameters, such as the sound level. Litigations because of noise nearly always focus on the long-term average acoustic energy (Lex), or one of the many variations. The measure shall indicate how loud it was on average. Unfortunately our auditory system – focused on extraction of information – is not able to determine this value. Nobody can say whether Monday afternoon was louder than Tuesday afternoon, based on his or her auditory experience. Measuring and using the Lex people should be aware that there is no equivalent in human perception. Such measurements should not be used to determine what sort of noise is intolerable. We have to separate thoroughly between messenger and message, Fig. 2. For the auditory system message-extraction come in two forms: Its job is getting information, and its hobby is handling music. Managing incoming sound requires both, the ears and the brain, and so it is no surprise that both can suffer, Fig. 3. It affects the ears, and in most cases the hair-cells (=hearing cells) of the cochlea are crippled or killed by massive acoustic events. Since these cells are not being replaced if killed such damages remain for life, the damage is permanent. Crippled cells appear to cause tinnitus. Most harmful are powerful, short impulses close to the ear, such as those from many weapons or even from some toys. 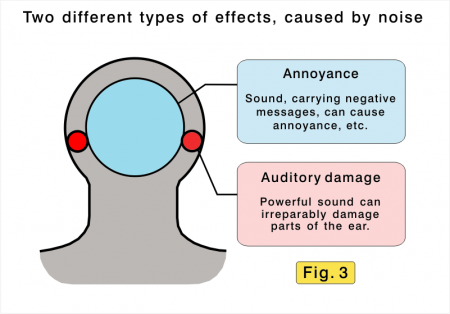 It has to be emphasized that such damage is caused by sound. 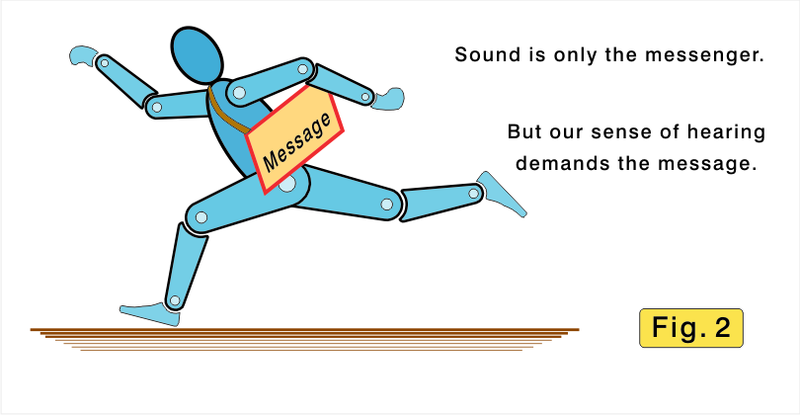 Caused by the message that sound is carrying, and not by the sound itself. Most of annoying sound is simply acoustic garbage of technical machinery, such as trucks, trains, airplanes, or factories. Many personal aspects are very important if someone is annoyed. Time of day: what is tolerated during the day is unacceptable at night. Attitude: persons who like the railway are likely to tolerate more noise from its operation. Necessity: ambulances and fire engines are tolerated because they are accepted as necessary. 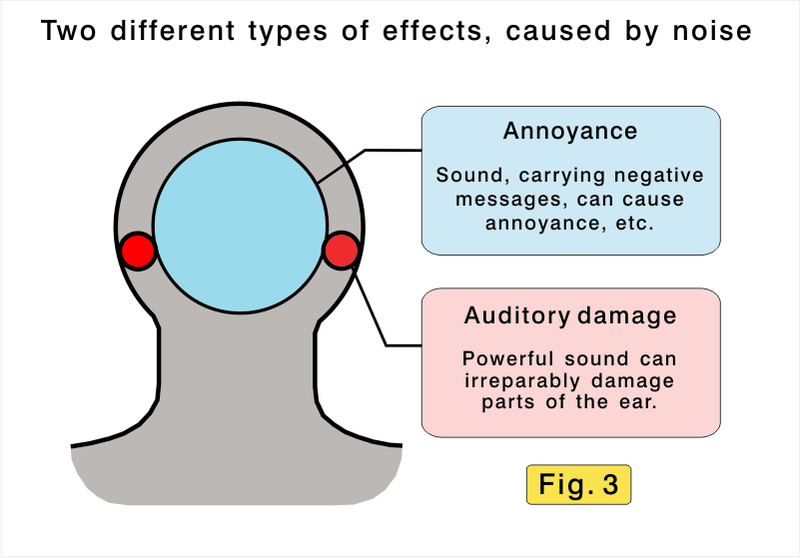 Other aspects influencing the personal judgment of being annoyed are age, type of someone’s activity, expectation of the acoustic surroundings, and tradition. A good example for messenger and message is the allied airlift in 1948 to supply West-Berlin with food and heating material by aircraft, after all terrestrial routes were blocked. For many months these loud aircraft arrived in Berlin with short intervals, but nobody complained about noise. On the contrary, people loved their acoustic emissions because they signaled food and survival. Nowadays airports are the target of many opponents, who hate aircraft noise. These days the message is different, people get acoustic garbage but have no advantage. Music is a special condition. Our hearing system is routinely categorizing what is being heard, based on personal experience. Positive events are called “music”, and a negative one is called “noise”. Music is capable of carrying emotions, and is deeply rooted in education and culture. It is a way of expressing joy, depression, anger, etc., independent of language. Emotions, stimulated and amplified by music, occasionally collide with feelings of other people, resulting in heated controversies. – Discotheques etc will be discussed in a special article. Lots of sound is often a form of stress, and that can have extra-aural effects. But this should not lead to the assumption that there is a direct connection between acoustic measurements and extra-aural negative health effects. Powerful sound can harm the ear, so that acoustic measurements at the ear are important. Annoyance is the result of the information received, and acoustics is therefore playing only a minor role. Noise is no acoustic problem, but in most cases it is a problem of how society is handling acoustic garbage. This entry was posted in Auditory Damage Prevention, Basics of Hearing and tagged acoustic garbage, annoyance, auditory damage, music, noise by gfleischer. Bookmark the permalink. Dear Gerald, much time has passed since you kindly gave me your book Gut Horen Heute und Morgen in 2000. I believe it was in the NATO Conference at the German Defence Institute. I have looked you up to seek your wise advice on a noise damage issue. Would it be possible for you to make contact so that we may talk please. Auditory damage is becoming an increasing problem with the younger generation due to ear buds and loud music.